We had so much fun packing for Dubai. One of the questions we were asked the most was in regards to the dress code. We thought we would go through what we wore throughout our trip! 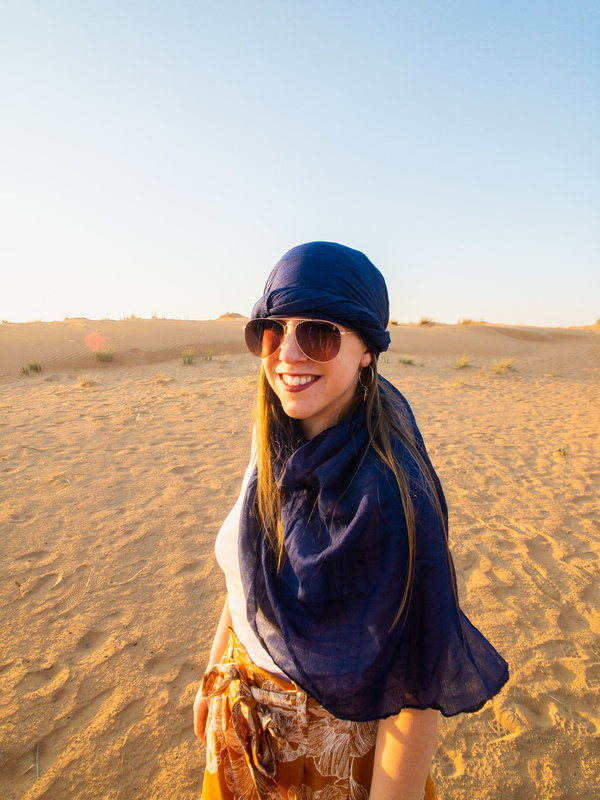 Going into this trip it was extremely important to us that we dress respectfully and abide by the cultural norms set by the emirates. While in Dubai, as a woman, you are not required to wear a hijab but you should be mindful to have your shoulders, knees, and any cleavage covered. 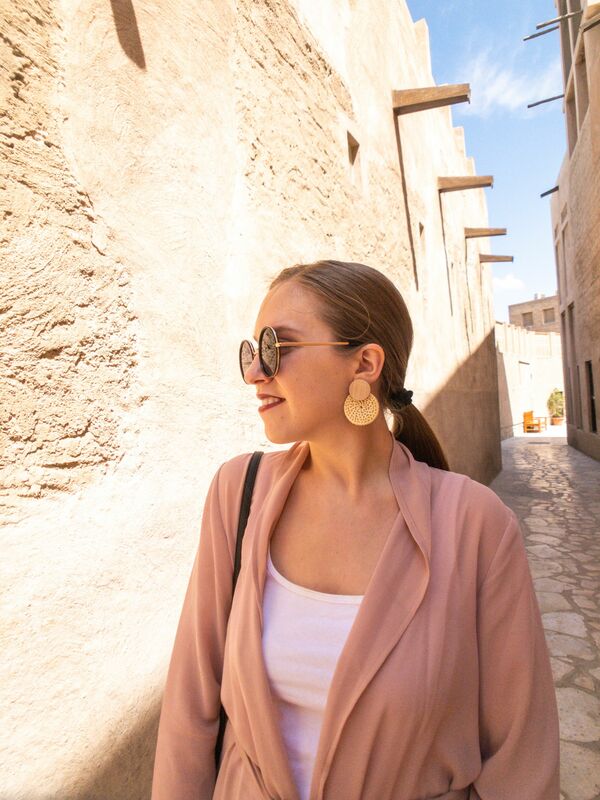 Since we were traveling in March when temperatures were not that high (70s-80s) we comfortably paired all of our outfits with long loose fitting and breathable kimonos. The only areas where a strict dress code is enforced is inside a Mosque in which you will be given the appropriated clothing (an Abaya) to wear. 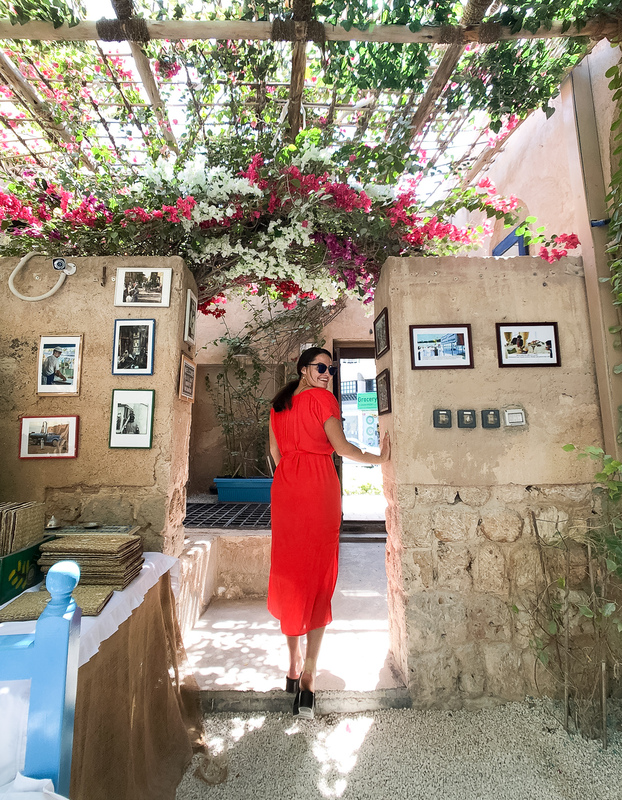 The Al Fahidi Historical District instantly transports you back in time. This district holds countless artist studios and the architectural design is culturally rich making for perfect sightseeing. Knowing the style and aesthetic of the area we matched our clothing and accessories to fit in with the soft light palette. This outfit was one of my favorites because it was so easy to pull-off a sophisticated yet laid back look. We paired our "Simply Perfect" statement wood/woven earrings with a full body pale pink kimono and matching flowy pants. 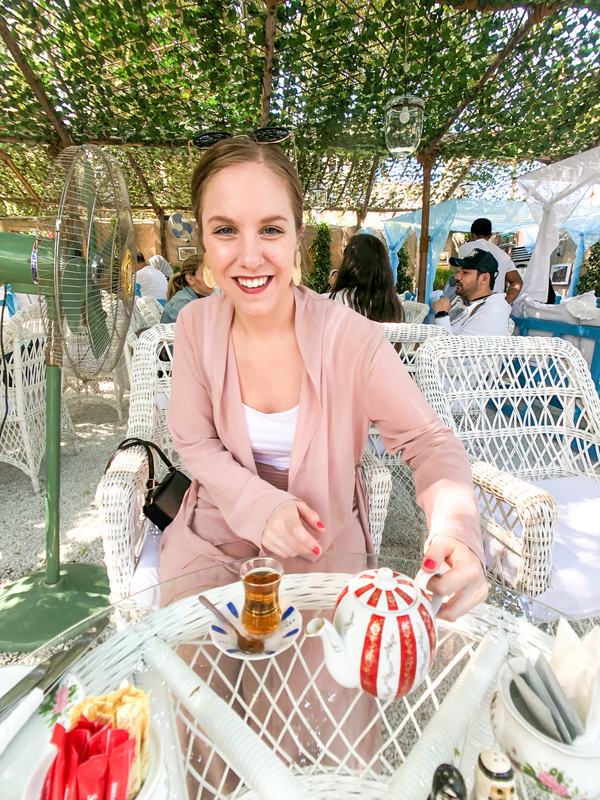 We spent part of the afternoon at the Arabian Tea House where we dined on a spread of delicious hummus, falafel and of course Arabian Tea. Many restaurants in Dubai do have dress codes for both men and women. As long as you are abiding by the standard of having you shoulders and knees covered you should not run into any issues. We wore loose fitting clothing both to show respect as well as stay cool. Nina wore our "Natural Beauty" Woven Drop Earrings paired with a simple but vibrant red caftan. 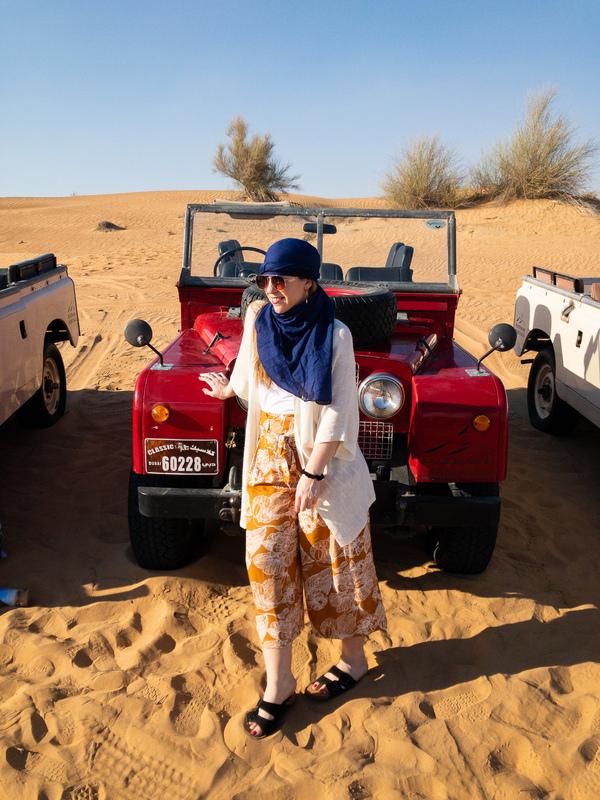 When in Dubai going to the desert is an absolute must. 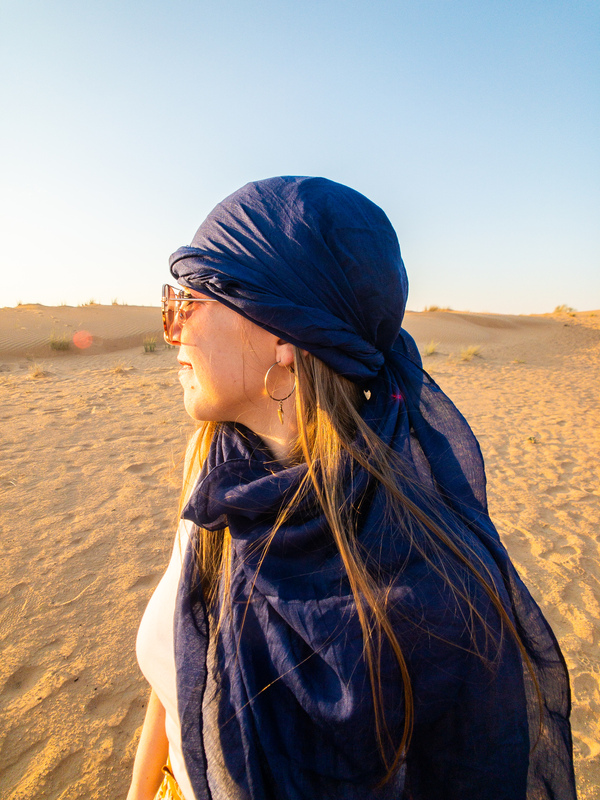 We went through the tour company Platinum Heritage (highly recommend) and took an hour long camel ride, watched a falcon show, and ate a traditional meal at a beautiful camp in the desert. Despite the hot temps during the day the desert does get cold at night so we recommend bringing layers. I wore golden tan floral print high rise bottoms with a simple white tank and cardigan. Even though I had a headscarf on I still styled it with our Straight to the Point Hoop Earrings. 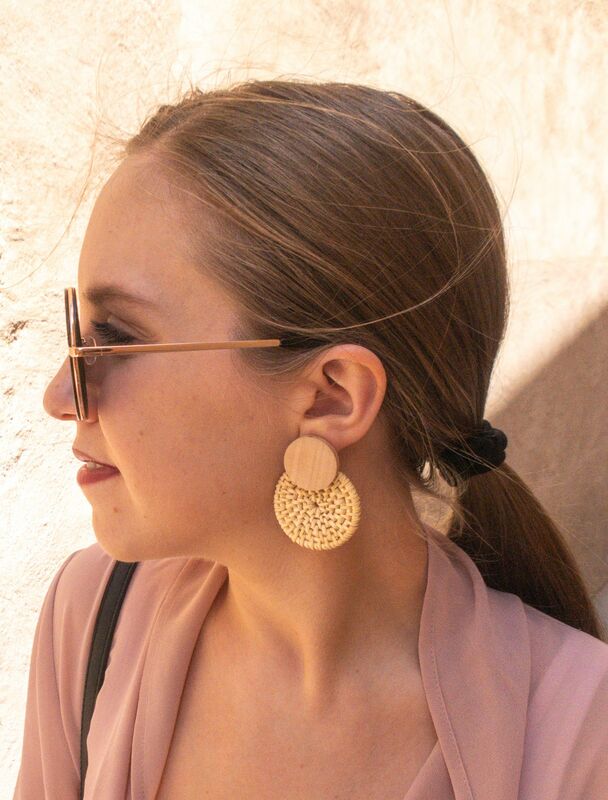 These hoops are medium sized but still very light-weight and have a cute geometric charm that dangles at the bottom and adds a small design detail this simple style. 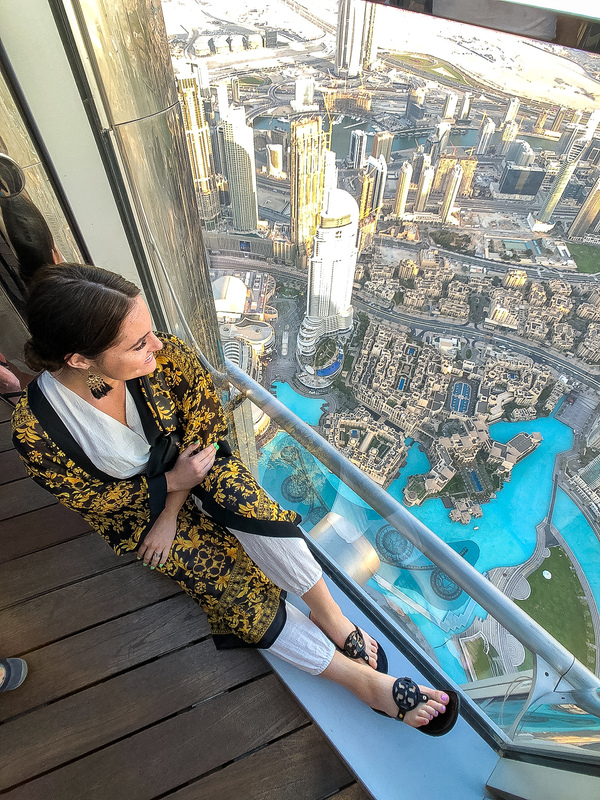 If heights aren't an issue the Burj Khalfia, which currently stands as the tallest building in the world, is the perfect place to get an outstanding view of the city. We went at sunset and while is was more crowded than it was well worth it to see the stunning Arabian sunset. The Burj Khalfia is connected to the Dubai Mall which is also the largest mall in the world (1500 stores). Similar to certain restaurants there is a dress code for the mall to be aware of (covered shoulders/knees). This area is known for it's fun and lively atmosphere with an amazing outdoor space so Nina wore a vibrant lightweight gold leaf print kimono over a linen white jumpsuit. When accessorizing with a bold print we always find that by keeping the color palette the same accessories are able to compliment your statement piece not take away from it! Our Enchanted Earrings are gold with black tassels add texture and dimension to her look. 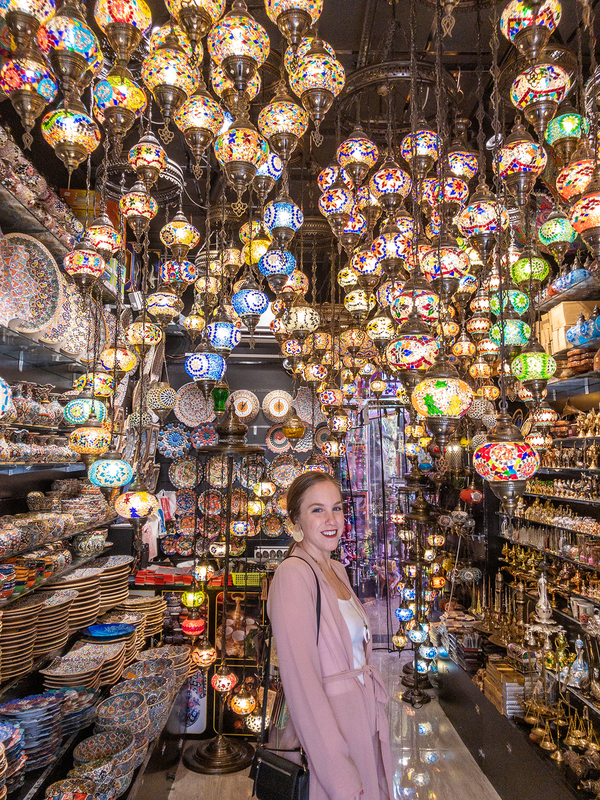 The Souks mark the more traditional side of the city. They are packed with aromatic spices and hand-crafted gold jewelry. If you are interested in buying gold this is most certainly the place be! The Gold/Spice/Textile Souks are side by side to one another which allows you to easily visit all three. The markets make up part of "Old Dubai" which can be reached by a quick 5/10 minute ferry ride. While this area does attract a lot of attention from tourists it is much more of a residential part of the city with a large amount of locals flocking to it as well. Since we were dealing with many small local business owners (mostly men) we were mindful to dress respectfully and covered. Dubai is an amazing cultural blend of both traditional and modern values. Everywhere you looked there was progress and development being made to grow this city. We were grateful to be able to have shared in what makes Dubai and it's people so special and we can't wait to go back!